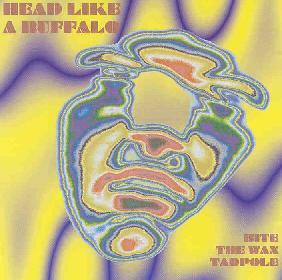 Head Like A Buffalo - "Bite The Wax Tadpole"
I first heard Scottish quartet Head Like A Buffalo on the To Jupiter And Beyond compilation (Aporia Records), and having liked their track I was pleased to receive Bite The Wax Tadpole which features a very nice set of their garage rockin' psychy tunes. The band consists of Sheila Adamson on vocals, Bob Adamson on bass and vocals, Douglas Crowther on guitar and backing vocals, and Steven Orr on drums and backing vocals. The bands sound is rooted in garage rock though psychedelic influences are apparent throughout. All along I was reminded of a fantastic band I used to see in Atlanta, Georgia clubs in the mid-1980's called The Swimming Pool Q's. Similar to Head Like A Buffalo they had bashing garage guitars and a female vocalist with a unique slightly off-key style that worked beautifully with the music. "Tastes Like Art" is the track from the compilation that first turned me on. I love its head pounding rhythms and freaky psychy guitar weirdness. Other highlights include "I'd Rather Be A Drug Dealer", which features pounding bass and wailing guitar licks that crossover between the garage psych and New Wave realms. High energy and a damn good song. "Grit Your Teeth" and "We Care (Because You Do)" are both smokin' rockers, with the former showcasing more spaced out guitar sounds. I love the mindfucking crash guitars on "Charlie Don't Surf" which make for a wild contrast with Sheila Adamson's vocals. One of my favorites on the CD. And "Love/Hate" is the most overtly psychedelic song on the CD. Like a heavy garage version of Jefferson Airplane with some very cool spacey trip guitars. In summary, you'll hear killer garage psych on this disc along with some well done songs. The CD is a few years old but I've heard from the band that more may be on the way soon. For more information you can visit the Uncanny Recordings web site at: http://www.symbolstone.org/uncanny/. Contact via snail mail c/o Uncanny Recordings; 101/5 Montgomery Street; Edinburgh; EH7 5EY; Scotland.